Does your boat have an engine cover with gas struts? The struts do help open and hold open engine covers. The important words are "hold open" because it's not if the struts will fail, it's when. These covers can be very heavy and when they do come down unexpectedly can cause damage to anything in the way. Today's gasoline contains 10 percent refined alcohol and can cause headaches for many boaters for a variety of reasons. Among other things, ethanol is a solvent that can degrade elements within the fuel system, it may have a shorter effective life span than regular gas, and it bonds with water molecules better than gasoline, which eventually can pull water into a fuel system. A refined alcohol, usually made from corn, ethanol is hygroscopic, meaning it has a strong attraction to moisture. 1. Keep your gas tank as full as possible, especially if the boat sits for an extended period of time. 2. If your boat is equiped with one, have the fuel separator/filter replaced every year. 3. Use one of the fuel additives shown below, as directed, at every fill up. They are available at most auto parts stores. 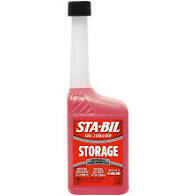 Although they also stabilize fuel, we recommend Sta-bil (RED) for long term storage. 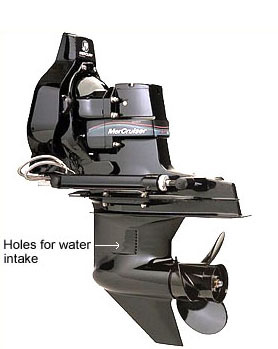 While winterizing boats last fall, I noticed a problem with the water intakes on many boats. Engines may overheat (which could cause expensive repairs) due to Zebra Mussels blocking the engine cooling water intakes. Keeping the trim in the up position when not in use may help but it's recommended (especially if the boat sits for a period of time) that you check to see that the water intake holes are clear. They are located on each side of the outdrive - see attached image. If there is a build up of mussels, they can be easily removed with a piece of wood and knife to clear the holes - be careful, they're sharp. The good news is, when the boat is removed from the water, the mussels will die and should fall off.